Is your bathroom old and outdated? 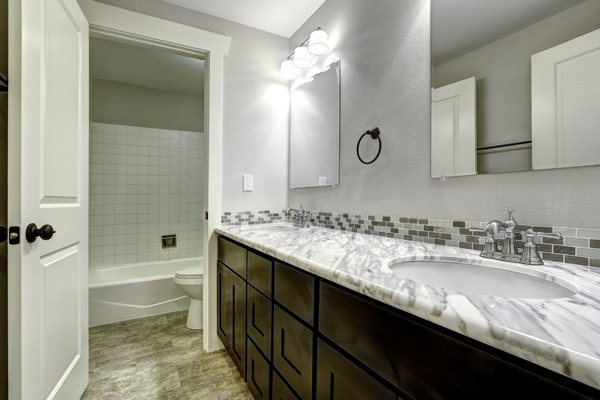 If so you should consider renovating your bathroom and updating it to give it a modern and sleek look. We can help you renovate your bathroom, whether it needs total remodeling or just adding some new modern fixtures and style. There are many different things to consider when upgrading the style to a modern look, let’s discuss some of your options. If you are going to renovate your bathroom, why not choose to use more eco-friendly fixtures? There are toilets and faucets that you can choose from that help conserve water. You could choose a toilet that gives you the option of how much water you need to use when you flush. This will help you save much more water per flush, and this is turn helps out our environment. There are also shower heads and faucets that you can choose from that conserve water as well. You might be afraid that these will not have enough water pressure, but you will not be able to tell the difference from a standard faucet or shower head. These options are also stylish and have a modern look as well, you can’t go wrong here and you will be helping our environment at the same time. It’s a win-win. One great modern upgrade you could choose is to have new flooring installed. There is a special flooring option that has a heating element built into the floor. Don’t you hate getting out of the shower and stepping on a cold floor? You will never have to do that again if you choose this luxury style flooring for your bathroom. A great way to make your bathroom look modern and to make it stand out, is by choosing a focus piece for the bathroom. You could choose a beautiful custom made bathtub that is modernly styled and base the rest of the bathroom style around the bathtub. This will make the whole bathroom flow together nicely and give it aesthetic appeal. When choosing a bathtub, don’t forget to choose one with jets to help you relax on those especially stressful days. There are many different options for renovating your bathroom and these are just a few. If you have any questions, don’t hesitate to contact us and we can help you with anything you need.